iFreeTools CRM - our free CRM built over Google App Engine and iFreeTools Creator - our free online database application builder, which were - until now - open only to users with Google Accounts, have now been opened up to allow all Google Apps users directly. Thanks to adopting new features enabled recently by Google, for its Google App Engine platform, Google Apps users need not look for work-arounds and request separate deployments to use iFreeTools. Users can also continue to login with Google Accounts, as before. Once user has logged in using either Google Accounts or Google Apps User Accounts, our app will check for the email-id of the logged-in user to identify the user and to authorize operations. We also plan to enable full OpenID support, very soon. What was until now just "CRM for Google App Engine" is now happy to call itself the "CRM for Google Apps, built over Google App Engine". Hope you find our new feature useful. Feel free to check out our apps and send in your feedback. 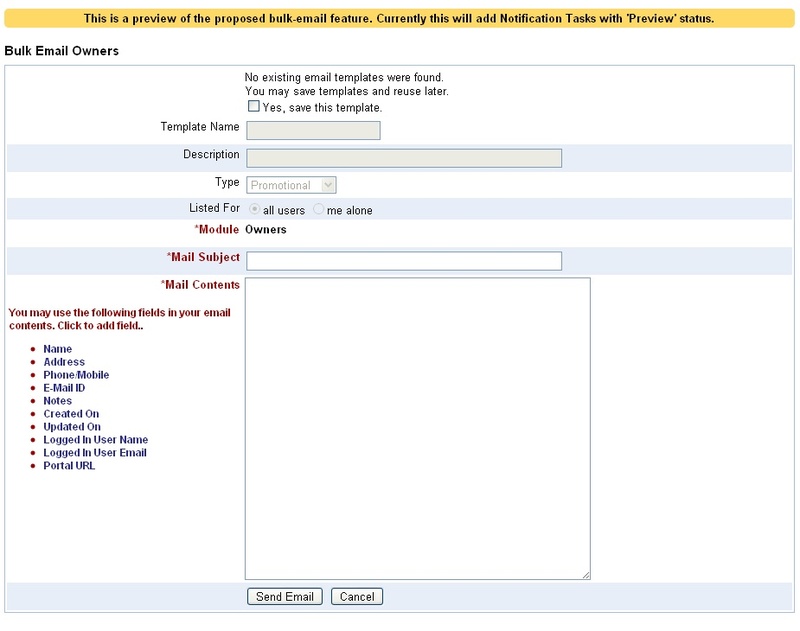 We are now working on have rolled in a new feature for iFreeTools, which is Email Templates and Bulk Emails. 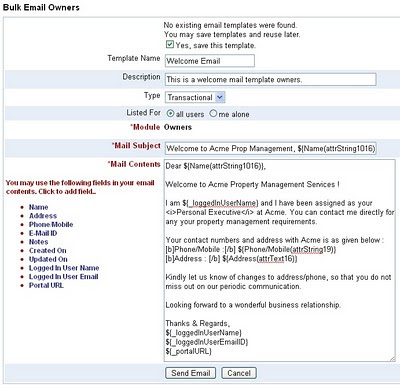 Email Templates enable you to automate mailing work by allowing you to define templates, which can include fields from the records and then to send out mails with their values replaced (mail-merge). 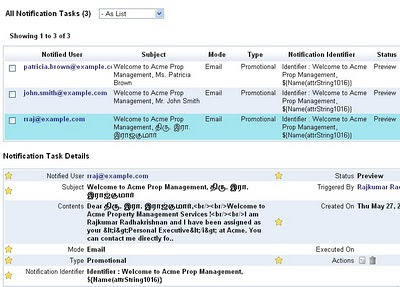 This new feature will now be supported for records which have an Email attribute. 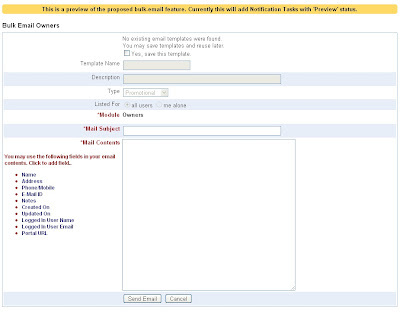 For iFreeTools CRM, this will include Lead, Contact, Vendor and Case records. 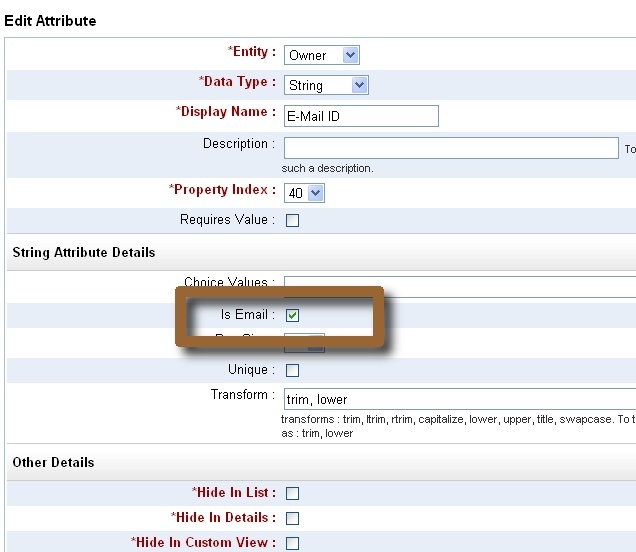 And, for iFreeTools Creator - where one can create their own custom database application online - String attributes can now be marked as email and will automatically get this feature enabled for those Entities. 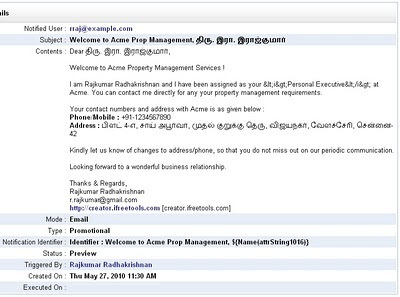 The following screen-shot image shows Owner's Email ID property, from the sample app used in our walk-through for using iFreeTools Creator, being marked as an Email Property. The transform function is also used to trim the values to remove spaces and convert it to lower-case. 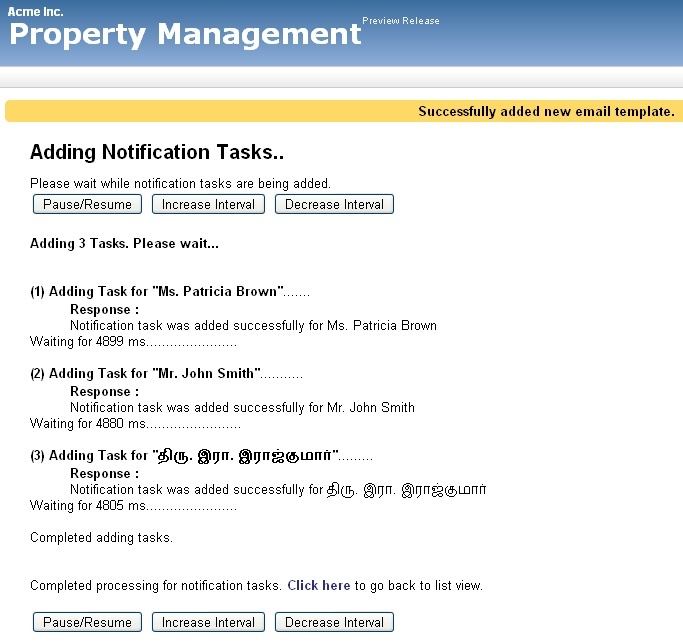 Similarly, we can also mark the Tenant's Email ID property. Once this is marked, a new action button will become available in the list views. 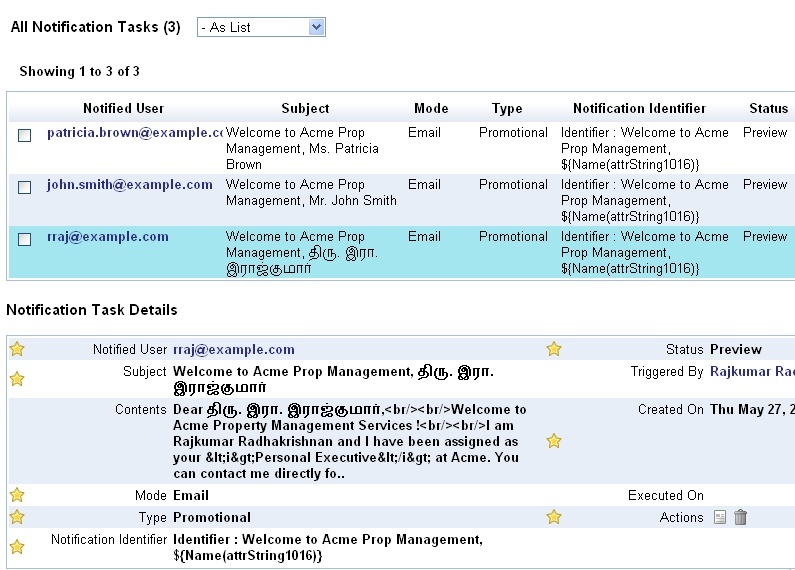 For the CRM app, as mentioned earlier, this has been pre-configured for Leads, Contacts, Vendors and Cases. In the above view, the option is disabled, because no records have been selected. The default view will be as given below. Since this is a preview release of the feature, the message on the top informs you that Notification Tasks will alone be added in Preview status - which means actual emails will not be sent, for now. 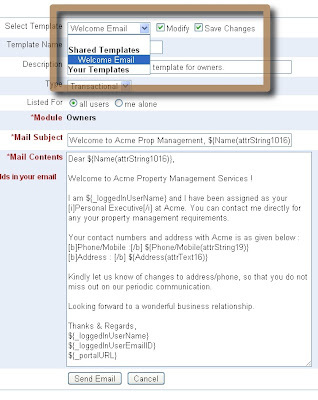 You will have an option to just send an email once or to save the template providing the name, description, type of email and sharing options. Admin users can create templates for themselves or for all users, like it is possible with our Custom Views and Custom Actions. 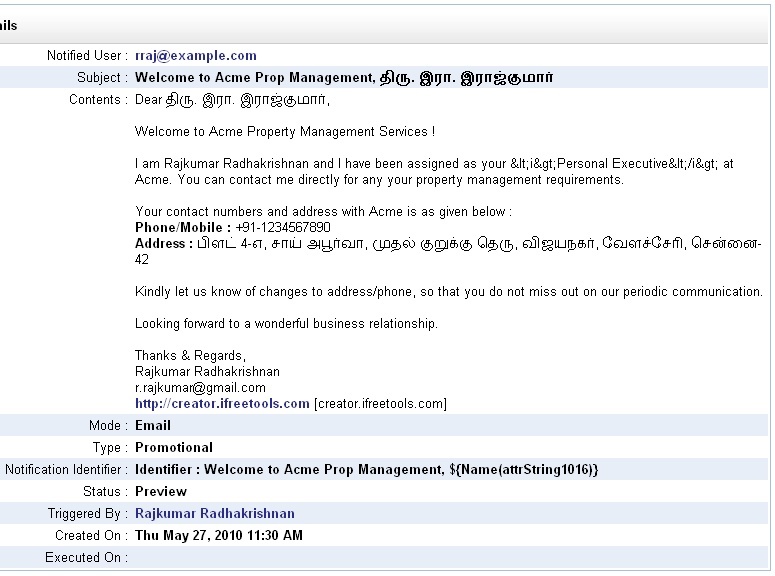 We will now proceed to create a Welcome Email template, and make it available for all users. One can include fields from the records, which are listed on the left on the content box and can be clicked to be inserted into the contents. You can also use BBCode. 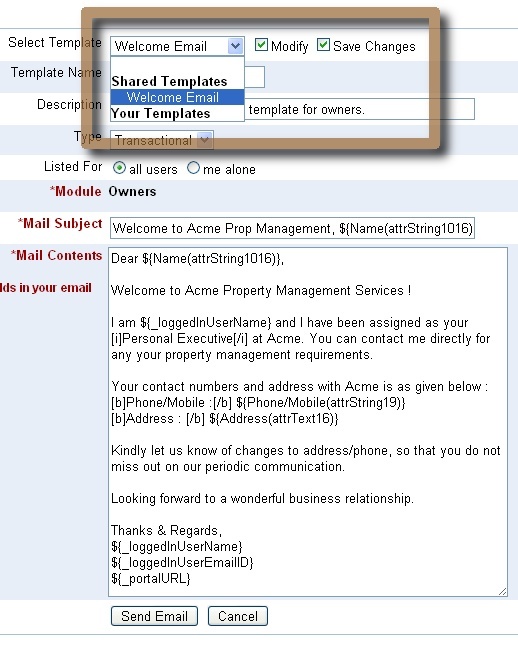 The supported BBCode tags are : b, i, u, s (strike), url, quote, img, list with *, size, color, center, code and p.
Fields are supported within mail subject too, as shown in the screen-shot below.. Proceeding to send email, you will see a page as shown below. Notice the message on the top, that the email template has been added. 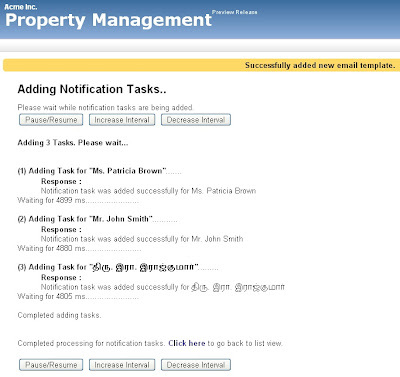 The notification tasks will be added sequentially for each of the record instances. Let us now check for the results. Clicking on the Notification Templates, we find the template listed.. Proceeding to the Notification Tasks view, we find 3 records present with status as Preview. Also notice how the values have been replaced with actual values from Owner records. And, this is one of the Notification Task's details view..
Notice that I had done a mistake in my template code by providing HTML instead of BBCode for the content "Personal Executive" - happens when switching between writing a blog post and the app, taking screen shots :-). Anyway, we can edit the template to correct this, which we will be doing now while explaining another important feature, which is Automatic Dupe Detection for Bulk-Emails. To explain how Automatic Dupe Detection for Bulk-Emails works, we will again trigger the Send Email from the Owners list view with all the records selected and proceed to the email-template view as given below. Now, select the template from the selection box and click on Modify and Save options next to that box. Edit the content as required and then proceed. 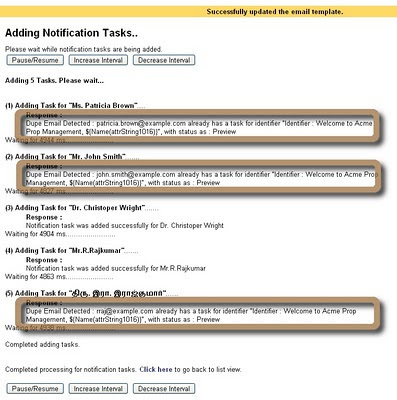 In the subsequent page, we will see the results for the notification tasks being added, as shown below. The engine will detect dupe emails based on the notification identifier, which for now is taken to be the subject of the email. So, notification tasks will be added only for those records which have not already been mailed with the same subject. This is a preview release of the Email Templates and Bulk Emails feature. 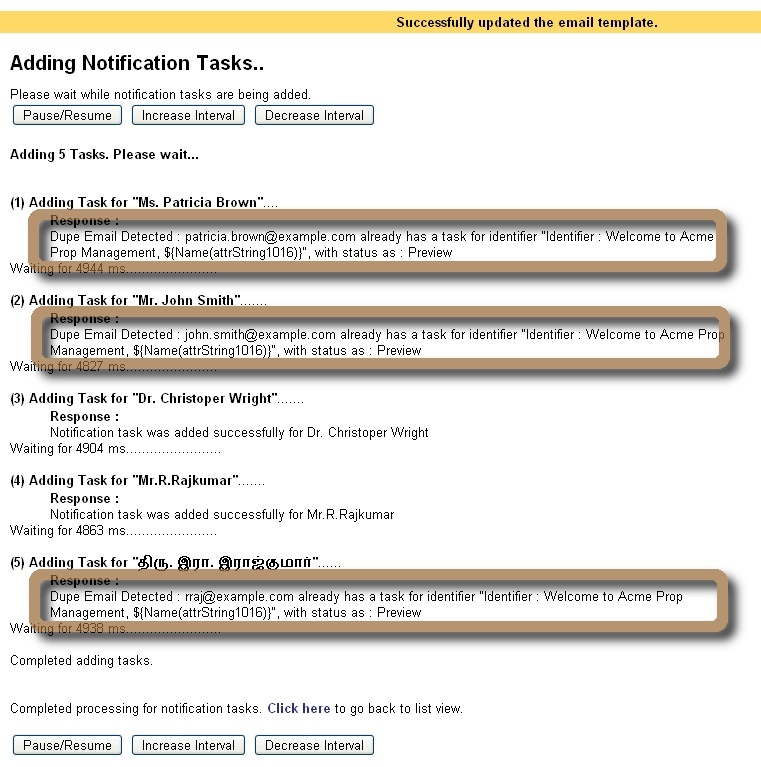 When this is fully enabled, the tasks would have triggered emails and end up with status as Executed. For each of the notified users, a record will be added in Notified Users, under Admin. This will be used to enable users to opt-out of notifications, if they prefer to do so - confirming to CAN-SPAM regulations for Promotional emails. We plan to integrate with SMS gateways too, which will follow the similar flow, except that the Subject will be ignored and the Content will have to be short. Play around with our iFreeTools and let us know your feedback on how we can make things better.